Just like your vehicle's braking system, the steering system is one of the most important vehicle safety and control systems, and it should always be in top shape. 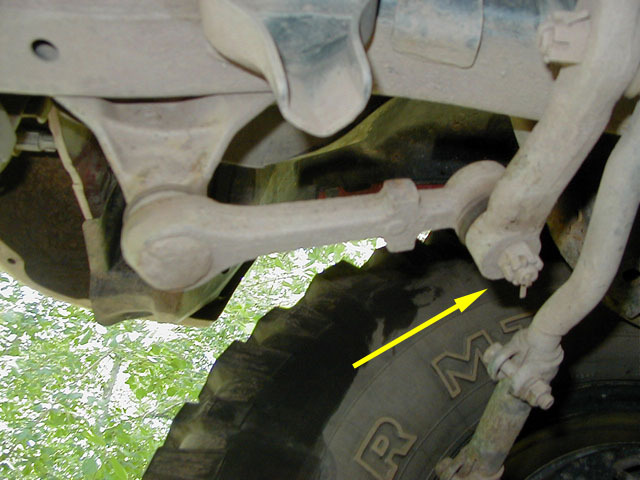 On Toyota 4WD vehicles with recirculating ball steering (pre-Tacoma and pre-'96 4Runner), an idler arm works in conjunction with the pitman arm to locate and c ontrol the steering links. The idler is infamous for worn bushings and for breaking on the trail: it is the worn bushings which this article will address. Worn idler arm bushings - exacerbated by offroad abuse - contribute to lack of steering response and diminished control, which is not safe on road or trail. The idler arm is located at the forward end of the passenger side frame rail. 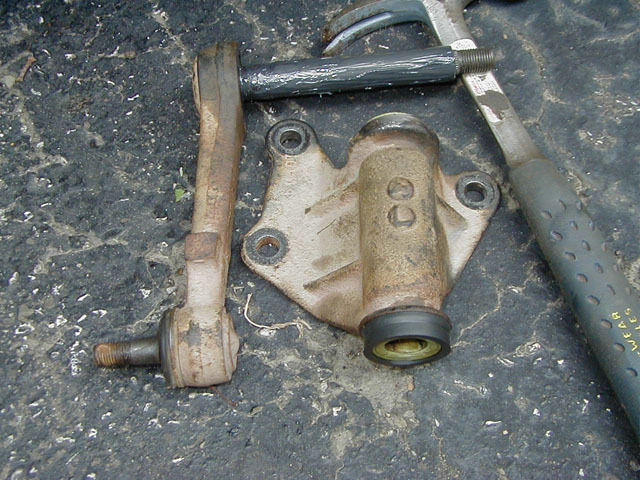 There are at least two ways to determine if your idler arm bushings are worn. The first, most obvious sign would be steering "feel": loose or wandering steering as the idler shaft moves laterally in the worn bushings. 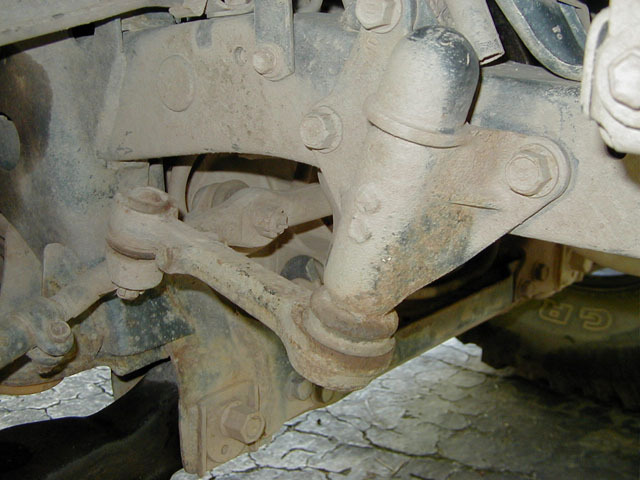 The second simple method of checking idler bushings is to have a companion turn the steering wheel while the vehicle is stopped, and observe the movement of the arm: if it pivots down or the arm moves sideways before wheel turn occurs, the bushings are worn. Fortunately, bushing and seal replacements cost less than $15 and takes maybe an hour of time to complete. 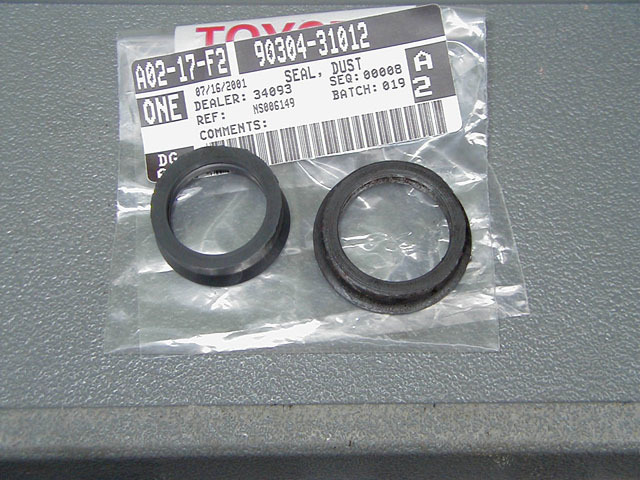 Two replacement bushings, Toyota Part Number 90386-19005 for newer trucks, and 90385-18068 for older trucks. Please check with the dealer to be sure which bushings are appropriate for your vehicle! This entire procedure can easily be done without raising the vehicle. On an IFS vehicle, begin by removing the skidplate. Pull the cotter pin from the idler arm stud through the steering link, and remove the 17mm castle nut. The arm must then be removed from the link: for this, I used a pickle fork. I greased the tines of the fork and drove it towards the stud and popped the stud free without damaging the grease seal. The castle nut is secured with a cotter pin to the steering link. The three idler housing nuts on the inner frame rail. The idler is secured to the frame rail with three 17mm hex-head bolts. Put the box wrench on the bolt head, and use the socket to remove the nut. They are likely to be very tight, so a cheater bar or penetrant may be necessary. 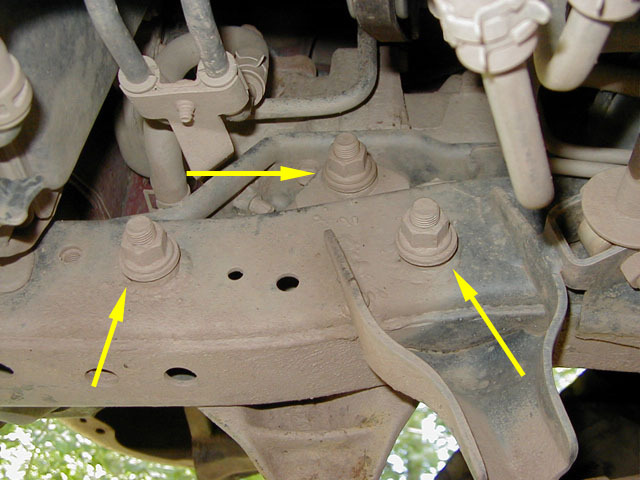 Once all three bolts are removed, the entire idler assembly can be removed from the vehicle. Note: the shortest of the three bolts is for the upper mount. This is the complete idler assembly. 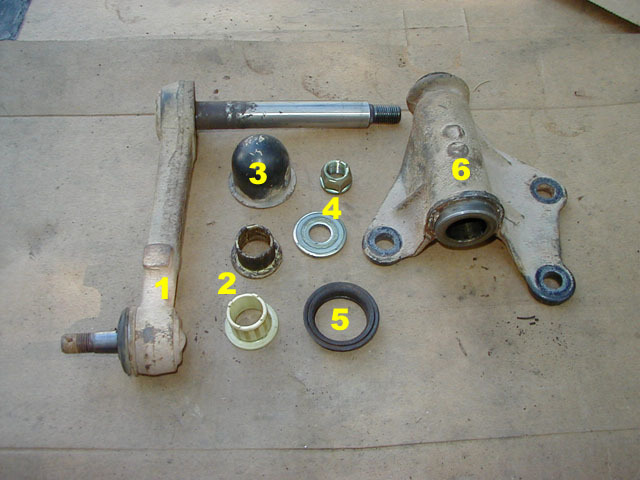 1 - idler arm; 2 - bushings; 3 - cap; 4 - washer and nut; 5 - grease seal; 6 - housing. At this point, you're ready for idler arm disassembly. Begin by removing the metal cap on the assembly: tap a screwdriver into the seam around the cap and the housing and pry it off. Next, remove the 19mm shaft nut and washer, then lightly tap the arm out of the housing. There are two bushings at either end of the housing which can be pried out with a screwdriver, taking care not to score the inner housing. On this idler, the deteriorated grease seal contributed to a corroded lower bushing and shaft, and both bushings showed signs of wear and having been wallowed out by the shaft. The grease seal is on the bottom of the housing and can simply be pulled off: this seal may not be bad, but for the cost and time involved (and per Toyota recommendation to not re-use it) it's a great idea to replace it. Once the bushings are out, disassembly is complete. The old and new bushings. The new and old seals. Greased up and ready for reassembly. Clean as much of the old grease from inside the housing as possible, then liberally pack the area for the shaft with a quality MP grease. Install the new bushings and coat the inner surface with grease: the outer bushing surface and housing should be dry. The bushings can easily be driven in with the palm of your hand or with the socket. Install the new grease seal at this point if you are replacing it. Be sure to clean the idler arm shaft of any dirt or corrosion with a fine steel wool, then reinstall it to the housing. Replace the washer on the top of the shaft and tighten the nut to 58 ft. lbs. Toyota recommends resealing the cap with an adhesive, but I used grease to form the seal. Once the cap is on, the idler is ready for installation. 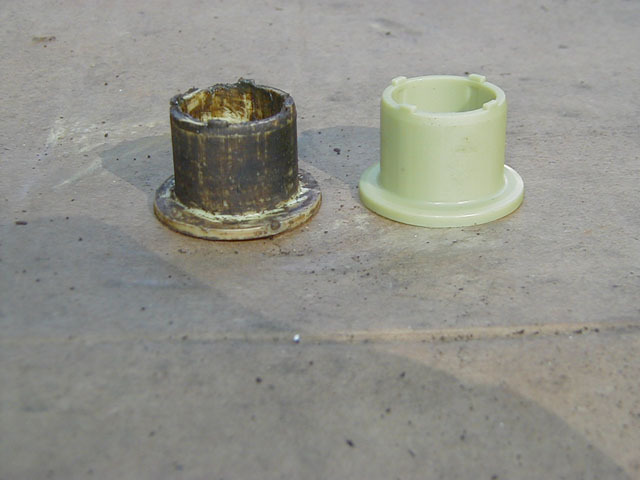 Note: By reinstallting the cap with grease, a good seal will be formed and subsequent cap removal will be simplified. This allows any future servicing of the idler to be done without removing the housing from the vehicle. Simply pop the cap, remove the arm from the steering link, and perform the required maintenance. Reinstalling the assembly is very quick. Locate the stud of the idler arm end (the castle nut end) into the steering link, then hold the idler to the frame and start the bolts through. Place the washers and nuts on the bolts and torque to 105 ft. lbs. Push the steering link up towards the idler arm and start the castle nut, and tighten until the hole for the cotter pin is properly centered in one of the cut-outs, which should be around 40 ft. lbs. Jam the cotter pin in, bend the ends around to secure the castle nut, and your idler arm rebuild is complete. Then you should enjoy the freshened, more positive steering!